Ayesha serva (Walker, 1850) is a cicada found in the Philipines and on Borneo (Brunei, Malaysia and Indonesia), and Korea? This one is interesting. Back when Distant wrote the Homoptera. Fam. Cicadidae, Subfam, Cicadinae. 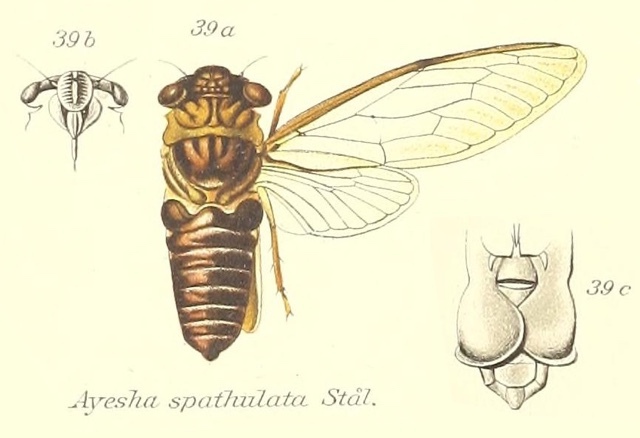 found in Genera Insectorum, 1932, there were two cicada species: Ayesha serva, found in the Philipines and Borneo, and Ayesha spathulata found in Korea. Today both species are unified under Ayesha serva. There’s a large distance between Korea and Borneo, so this makes me wonder, was A. serva actually ever in Korea, or are they two different cicadas? The image says Ayesha spathulata, but the newer name of this cicada is Ayesha serva. Characters. — Head (including eyes) as wide or a little wider than base of mesonotum, much shorter than breadth between eyes, lateral margins obliquely continuous to face or very slightly sinuate, eyes large and oblique; pronotum shorter than mesonotum, its lateral margins angulated anteriorly; mesonotum moderately convexly tumid; abdomen short, not longer than space between apex of head and base of cruciform elevation; tympanal coverings about as long as broad; rostrum reaching the intermediate coxae; opercula in male long, about twice as broad at apex as at base, inner .margins concave, widening to basal area, outer margins sinuate near centre, their apices broad overlapping;tegmina and wings hyaline, greatest width of tegmina about one third their length.